dbclunie: 3D Printing : Drying Filament For $15! 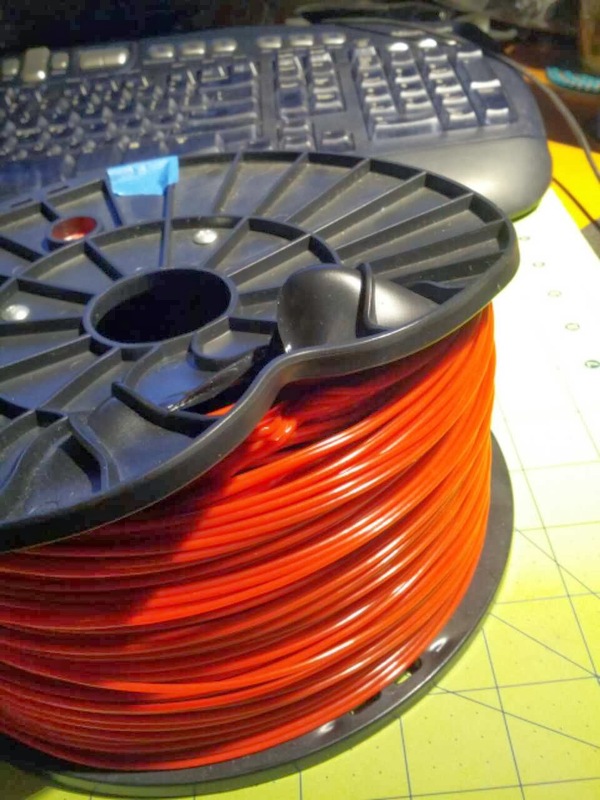 3D Printing : Drying Filament For $15! So to make this "device", its pretty inexpensive, and I was game to try drying out the filament so I can get it back to printing smooth as silk again. 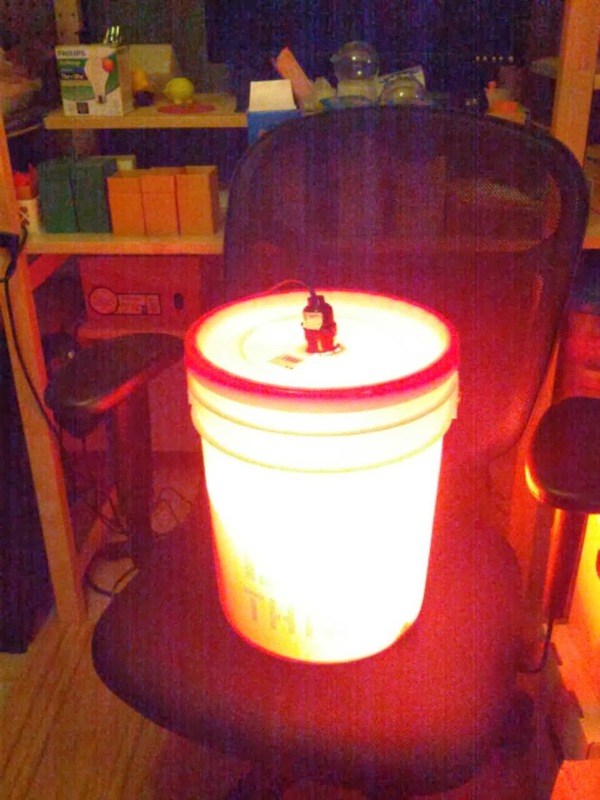 While I mentioned that I had found the project on thingiverse, I just gave a cursory look to the instructions and plans, after all what more is there than a lightbulb, 5 gal bucket, desiccant, and some hydro saturated filament?! You might want to follow the instructions a bit more to the letter or at least learn from my mistake. So what I did was hit up my big box home improvement store, grabbed a 5 gal bucket, a clamp light with a small reflector, some 4pk DampRid refills, and a two pk 100w light bulb. Total cost around $15! First I cut a quick hole into the top of the lid of the 5 gal bucket, just large enough to fit the light fixture through, and then screwed back on the aluminum reflector, its a snug enough fit that I didn't need to glue or ad any other items to it. Next I placed in the bottom the DampRid, two packets and on top of those I placed two spools of filament. ONLY DO 1 SPOOL AT A TIME! As you can see the second spool was too close to the bulb that it actually melted the spool itself and some of the filament! Don't worry i should be able to save the spool and just cut out the fused bit. Instead of using a100w bulb, which the clamp light is rated for only 75w anyways, whoops!, I'd swap out the 100w and use a 25w or 35w bulb. I only operated the device while I was awake and and checking on it on a regular basis when I was using the 100w bulb. I would assume with a 25w bulb you could leave it on for extended periods without issue. I'm going to swap out the light bulb for a lower power one, but still will only do one spool at a time, then keep those newly "dried" spools in zip locks with more DampRid/Desiccant so I don't have to go through this procedure again hopefully. The pics looks wildly different because I increased the bracketing on my cell phone camera, so don't worry the 2nd pic isn't glowing WHITE HOT! 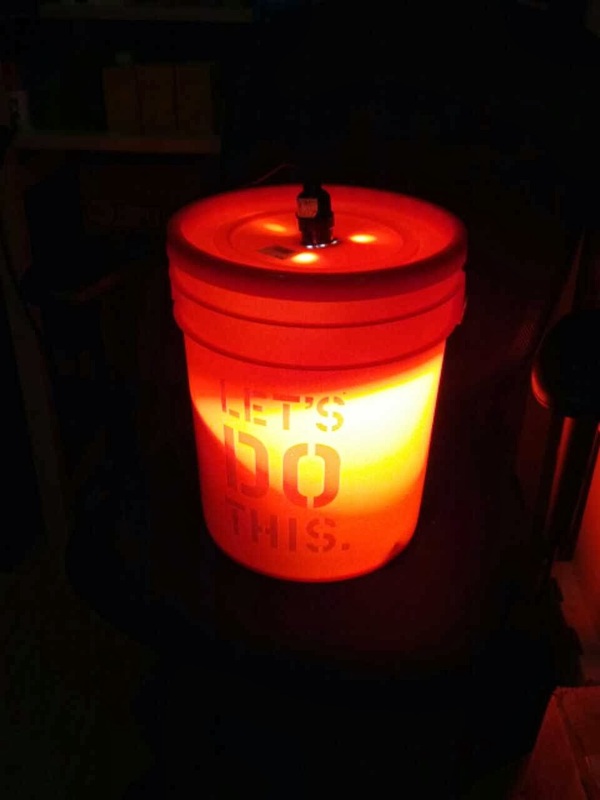 Overall the aluminum reflector gets too hot to touch, but the plastic around it and in the bucket remain warm to the touch. The room I did this in smelled a bit of plastic, so ventilation would be recommended, and as mentioned before I would recommend using a lower wattage bulb and a longer period of time drying one spool at a time. This should work with both PLA and ABS, thought especially with PLA I would use a lower watt bulb than 100w as you would end up i think melting the PLA into an unusable block of filament.